German Chancellor Angela Merkel has been forced to compromise on economic policy to win the support of the Social Democrats and gain a third term in office. Germany's new coalition government promised Europe more "tough love" Wednesday while offering some concessions at home to workers and pensioners. Europe's biggest economy said it will continue to stand by the eurozone's weakest members, provided they stick with painful austerity and structural reforms that will put the region's fragile recovery on a sustainable footing. Conservative Chancellor Angela Merkel signed a provisional government program with the center-left Social Democrats, which secured her a third term in office in exchange for policy compromises. The coalition said it would introduce a minimum wage of €8.50 an hour from 2015 -- a move some experts say could help 17% of the German workforce, mainly in the service sector. Most wages are currently set in negotiations between companies and unions, and there is no statutory national minimum. Germany will also improve pension benefits -- from July 2014, workers who have paid social security contributions for 45 years will be able to retire on a full pension at 63, two years earlier than currently. "After lecturing everybody else about the absence of fiscal responsibility, a cut in German retirement age seems just a touch odd," tweeted HSBC chief economist Stephen King. Merkel was the clear winner of national elections in September, increasing her party's share of the vote as Germans backed her handling of the eurozone crisis and economic record. But a collapse in support from her previous coalition partner forced her to seek a coalition with the main opposition party. Germany is the second most productive of the G7 economies after the United States, based on GDP per hours worked. Its position as one of the world's top exporters shielded it from the worst of the eurozone crisis, supporting growth and jobs. France, which is at risk of slipping back into recession, has a more generous minimum wage but Germany will pay its lowest earners more than the U.K. or Spain. The new German government will limit the use of temporary contracts and require employers to pay hirees the same as permanent employees after nine months. Merkel said the coalition was committed to maintaining Germany's balanced budget and further improving the country's competitiveness. Economists said the program, which also includes a modest increase in investment, could boost domestic demand -- pleasing critics who have accused Germany of relying too heavily on exports in the past. But with the oldest population in Europe, the concessions on pensions and the dilution of other reforms could cause problems further down the track. 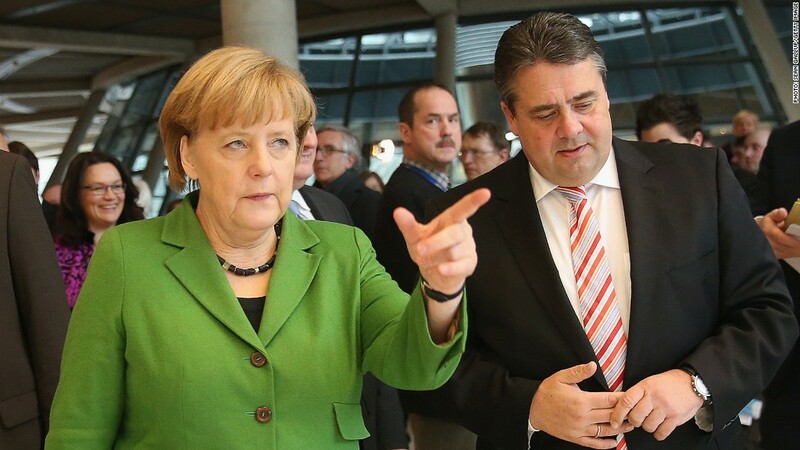 "The roll-back of labor market reforms and the spending increases may come back to haunt Germany in the next downturn, which may be more than four years away and thus be a problem for the next government," noted Berenberg senior economist Christian Schulz. The new government also stated its commitment to a proposed European tax on trading in shares and bonds, and said EU funds could only be used to help ailing banks as a last resort and under tough conditions. Social Democrat party members will vote on the coalition agreement in the next few weeks. They are expected to support the deal.